As I write this we’re on a train somewhere between Marrakech and Fez. Over this 7-hour journey we’ve made a friend. A few stops into the trek a Moroccan man joined us in our cabin. His self-given English name is Danny- I have no idea how to spell his Arabic name. Within the typical polite conversation topics we learned that Danny is married to an American woman of Congo/Indian decent who is from Savannah, Georgia. They met in Spain. What a melded world we live in. Currently his wife is working for the UN in Liberia. A few hours into our conversations Danny called his wife and passed the phone to me for a moment of Georgia nostalgia from both ends. Another hour in after we told him we didn’t have an exact plan for our time in Fez, he called a friend, Mohamed, who is a guide in Fez to see if he was available. Now he has arranged for Mohamed and his driver to meet us at the train station with a sign for pick up tonight. Tomorrow Mohamed and the driver will spend the day with us going to all the sights in the city and then a walking tour inside the walls. We already negotiated the price through our Arabic speaking new friend. This was the easiest travel planning we’ve done yet! 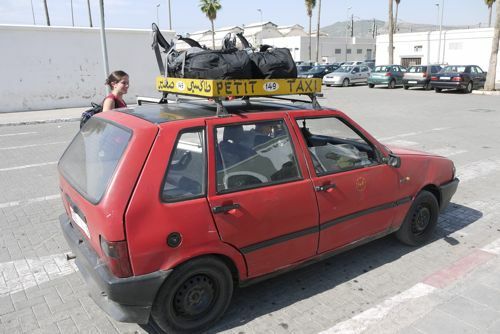 Now we’re discussing a day trip to the Atlas Mountains using the same driver. Danny just did his prayers for the second time. Words in quiet tones, eyes closed, hands together, and bowing from his train seat. No question we are in a Muslim country. We started at the cooperative pottery (fair wages, fair prices, quality goods, government oversight) just outside of town. We got to see the entire process of how they make the famous mosaics that are all over the country. It starts with clay brought in trucks from the mountains. 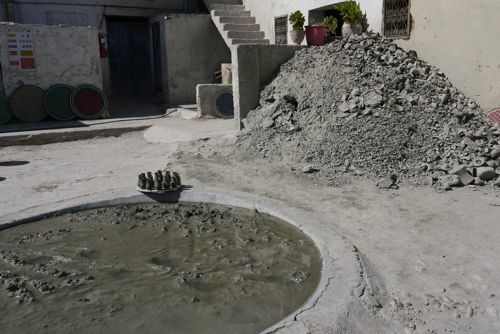 They then massage it with their feet for several days in a small pit in the middle of the workshop before shaping it into square tiles to be fired. After it’s fired once in the kiln they add color glaze and then fire it again. When the tiles are complete they trace the designs of the pieces on them and by hand men chisel the tiny pieces out. The men doing the chiseling had thick blue jean material in their laps but no safety glasses on! All of this work is done while sitting on the ground. After the design is complete (which could take months for large wall pieces) they pour hand mixed cement to fill in the spaces on the back. 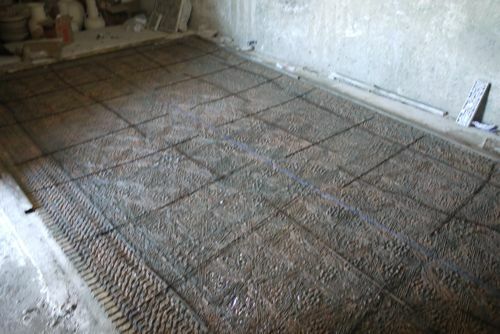 For large pieces they also use some metal rebar on the backside of the tiles for strength. Once the concrete is completely dry they pick up the surface and it’s ready to install. 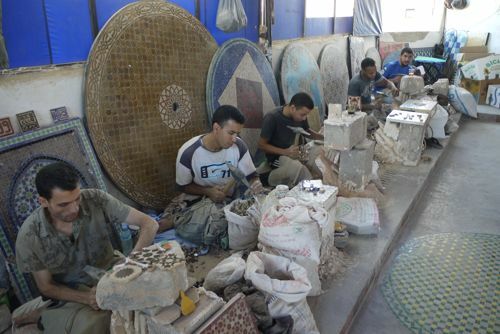 We watched one man work on a piece for King Mohamed V’s mausoleum (the previous king). He had been working on it for 2 months. What we saw was the backside- the upside down mosaic pieces with concrete being poured to connect them. All of the riads, restaurants, offices, mosques, hotels etc. in Morocco had walls covered in mosaic tiles. The floors are done this way, as are many tables and doorways. 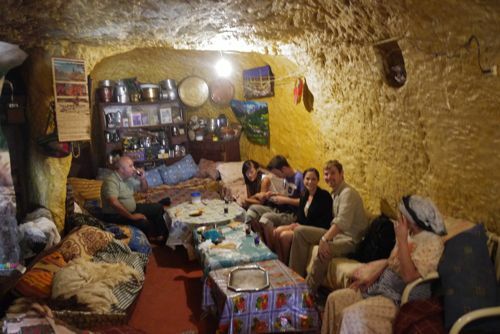 This pottery cooperative also creates other things such as tagines (traditional low and slow cooking pottery) and serveware. 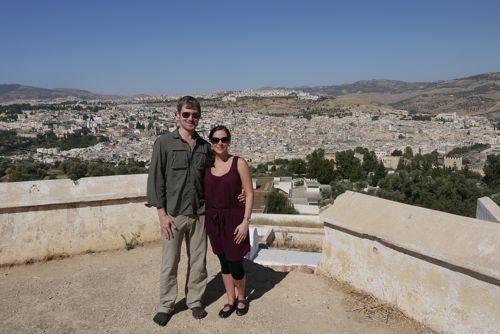 We drove up to an outdoor mosque used for only special festivals on top of a hill for a panoramic outlook to Fez. 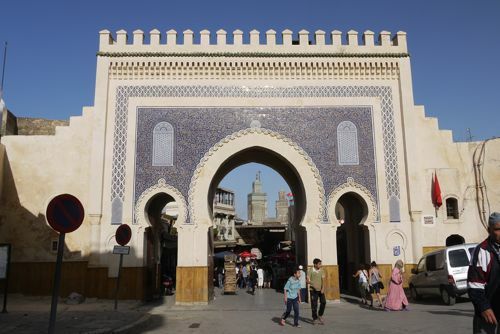 The population of Fez outside the city walls is around one million. 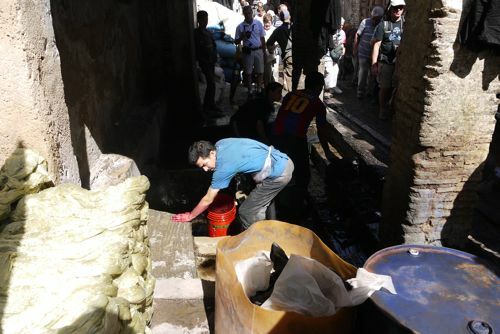 Inside the city walls, the medina, 600,000 people live. There are no cars, no motorcycles, and no bicycles. It is the largest contiguous pedestrian area in the world. 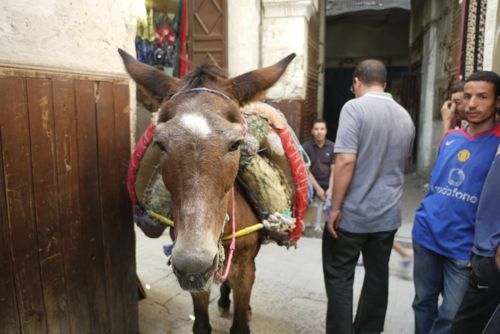 Only donkeys and horses are used for transporting heavy things inside the walls. There are over 12,000 “streets” none of which are labeled. 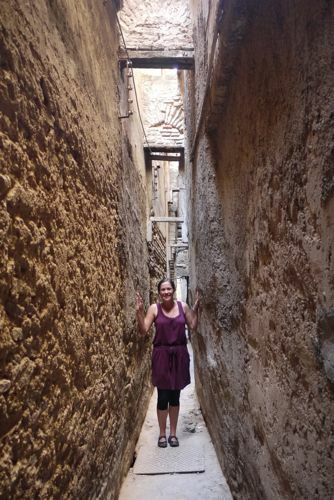 It’s a complex maze of narrow streets made of dirt and broken stones. 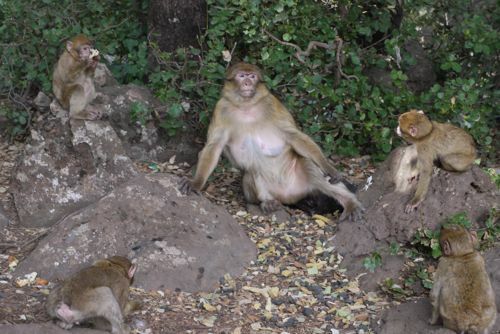 School isn’t mandatory in Morocco. It is available if you choose to attend and can pay the fees. Of the people living inside the city walls 80% are illiterate. We took a walking tour inside the walls. 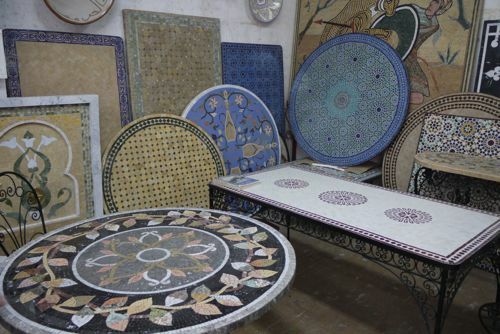 Fez is known as the capital of the “Handicrafts” with many true craftsmen still working in their family trades. There are many tailors with their shops full of bolts of fabric. Most people here have their clothes made from fabric they choose. The traditional wear is called a djellaba, which is a long loose garment with full sleeves and a hood built in. Most of the women don’t wear the hoods up but instead add a headscarf. The fabrics aren’t just basic solids- they have patterns, color, and texture. There was a whole section of town where men were dying fabrics in the street. There were giant pots of dye and they were using their hands to swish the fabrics around in them. They use this same technique for silk and wool that is to be used for making carpets. Women personally go to farms to pick the animals they will get their wool from. They look for the youngest lambs (they check how many teeth they have to get the youngest available), which have the most valuable wool. Then the women shear the animals themselves with their personal scissors (freshly sharpened by the medina blade sharpener.) Picking the right materials to work with is one of the most important steps in making a carpet. It would be a waste to use bad wool and spend years making a piece that would not bring a good price when you need to sale it. We toured a carpet cooperative and learned about the different levels of carpets and their characteristics. 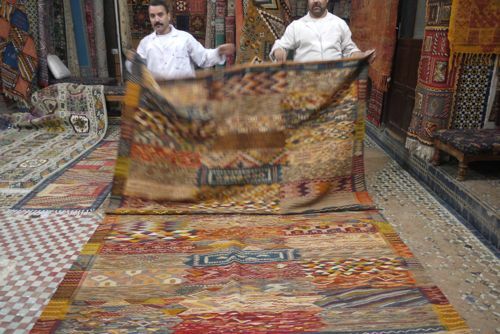 In addition to handmade silk and wool carpets, we were able to see a special type of Moroccan carpet that is rarely traded today- chouchou. They are a kilim style flat woven carpet done entirely by needlepoint. Unique to chouchou however is that it is two sided. It takes two women sitting on each side passing the needle back and forth to weave this type of carpet. Due to the amount of time and labor intensity required to make these (5 to 7 years in some instances) they are no longer readily made by local women. We walked down narrow alley streets and between buildings it seemed- but these are typical roads with doors to homes found here and there. The most traditional homes have old wooden doors on them, each one unique. Unfortunately, people have over time sold many of the doors. They have also sold panels of the handmade tiles you can see missing from the entrances. Once you have no money- you sell the pieces of your home. The wooden doors have been replaced with simple metal panels and the floors are broken concrete. We made a stop to see inside a Koranic school (Islamic seminary). We visited a tannery. This is where they color leather before it is made into things. The first step is a white process- The pieces of skins (sheep, cow, etc.) are dunked and soaked in a white lye and pigeon droppings (natural acid) mixture. This separates the skin and the fur. The skin is then transferred to the coloring stage. 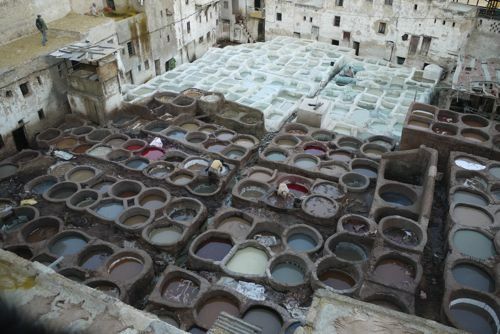 Like a human size tray of watercolors, the fabrics are dunked and soaked and mixed around in the enormous vats of dye. The dyes are all natural (red from poppy, yellow from saffron, green from mint leaves, blue from indigo, black from mascara rock) and the workers in this stage do not even wear gloves. Men were in the bowls of color up to their waists mixing the pieces of leather with their hands and feet. Once the pieces have enough color they are moved to the rooftops to dry in the sun. At this point the leather is ready to be made into shoes, bags, belts, etc. 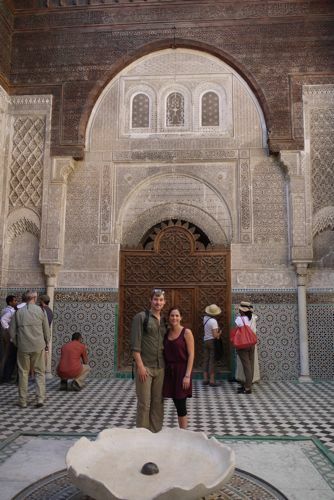 A drop in by the iconic Blue Gate and Royal Palace of Fez ended our day. Our driver Abdul picked us up for a day trip to the Atlas Mountains. We first dropped his 4-year-old daughter off at school. She is learning French and will start on English in a few years. 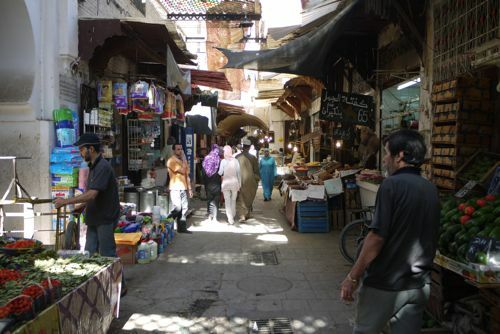 French is the first second language in Morocco but there are some efforts to change it to English in the near future. Back on the road, our first stop of the day was to an old small town village. 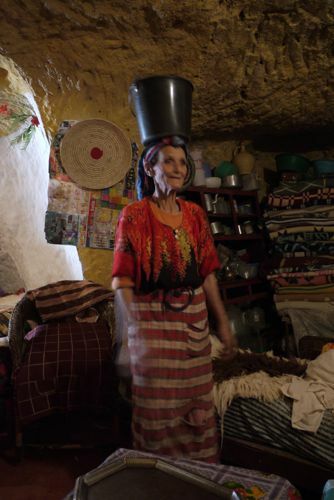 We walked through the very small town to a cave house where Ayesha, an 87-year-old woman lives. She invited us in to have tea. Abdul led the way. Her husband died last year and was 110 years old. She put a full bucket of water on her head and danced around to show how agile she still is. The cave is cool in the summer and warm in the winter. Offering tourist tea and a dance for a few dirhams is how she makes a living. 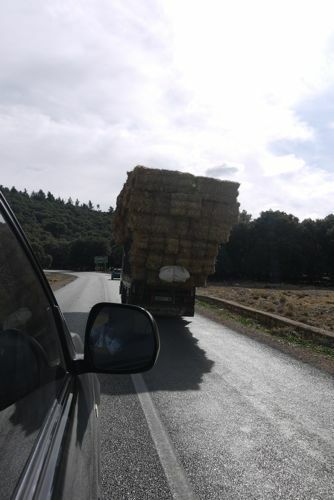 We drove through the weekly market town in the mountains where nomadic farmers bring their crops to trade. More often than not, goods are exchanged instead of currency. Quite a surprise driving through this dusty country was the town of Ifrane. This is a luscious green village built in a Swiss style with sloped roof chalets and natural springs. The community is a holiday destination for many as a hot spot for skiing, hiking, and rock climbing. The town is more recently centered on Al Akhawayn University, which opened in 1995. 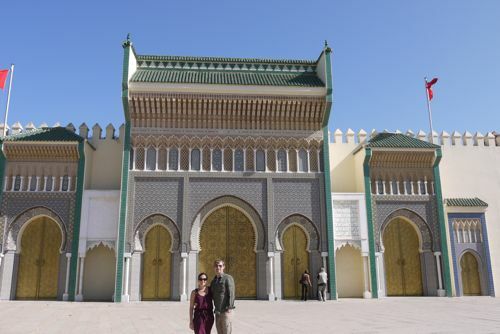 This is a premier university in Morocco modeled after the American university system. The school’s mission is based on principles of diversity and an international outlook with values of tolerance being stressed. Ifrane is also the location of an additional Royal Palace. The city was developed as a garden city with parks and lakes throughout. 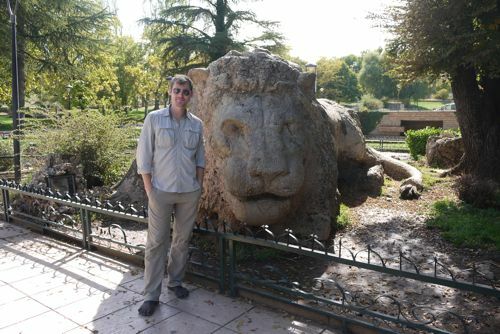 A giant lion statue carved out of a single piece of stone is the iconic symbol of the city and sits at the entrance of one of its central garden parks. We made a stop in the largest cedar forest in North Africa. In the trees lived monkeys- dozens and dozens. 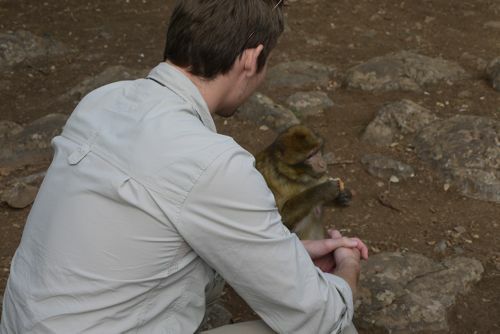 They were friendly monkeys. We fed them pomegranate, apple and even water and Diet Coke! 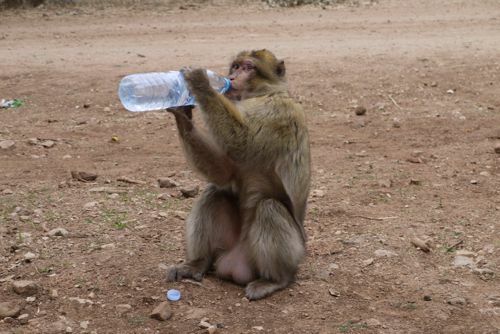 It was amazing to see a monkey act pretty much just like a human- they would hold the water bottle with both hands and drink from it. 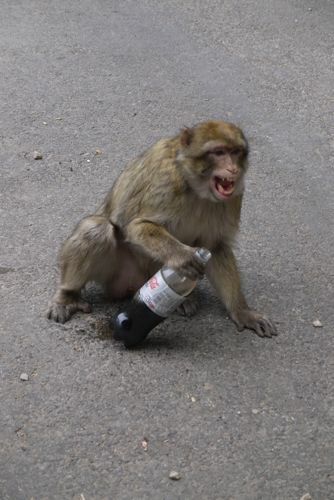 caffinated monkey- don't take my Coke! Their tiny hands would pick up an individual piece of pomegranate from you and peel the seeds out individually to eat. 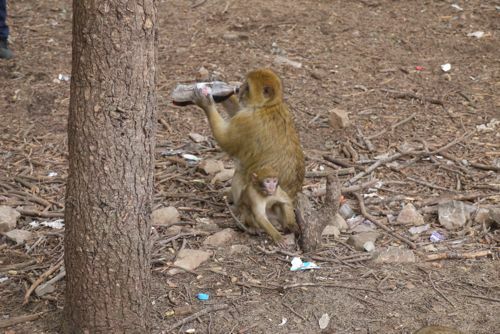 We did learn not to try and touch the baby monkeys- the mama monkey’s hiss was fierce. 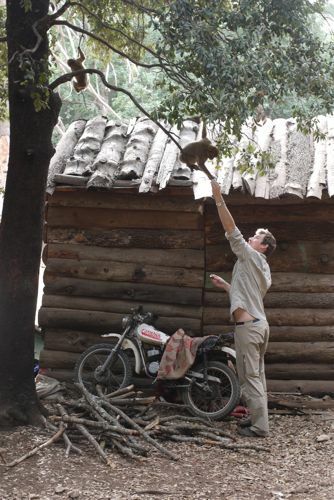 The kid monkeys played and swung from branch to branch. Pat played along- monkey see monkey do! After a great day of sightseeing we said goodbye to Abdul as he dropped us off at our riad just inside the medina walls. 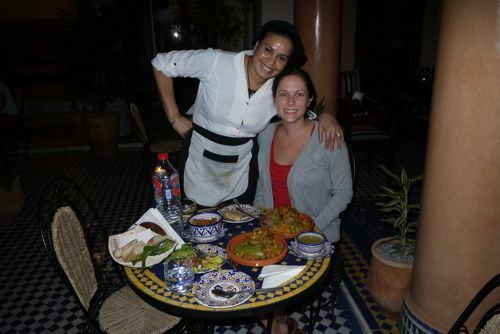 At our riad we ate a tangine dinner of lamb and figs with couscous prepared by the sweet Fatima who took such good care of us. The idea of having a driver and a guide sounded extravagant to us just a few days ago, but after being here we realize it was the best way to see this city. It was extremely affordable and without some local help we could have easily missed out on a lot of the highlights. Having a guide gave us a sense of security and acted as a translator and barrier to back off the others that constantly surround you here offering something good or bad. Initially the culture can be intimidating as an outsider. It’s unsettling to see poverty and need all around you while being pressured and begged from constantly. Quality and truth are sometimes difficult to discern in unfamiliar situations with strangers, but we’re learning. The word Inshallah (in Arabic: إنشال) meaning “God willing” was said to us many times over the past days whenever we would mention tomorrow, the future or hopeful plans for ourselves or others. We’re excited to see what’s next- Inshallah.